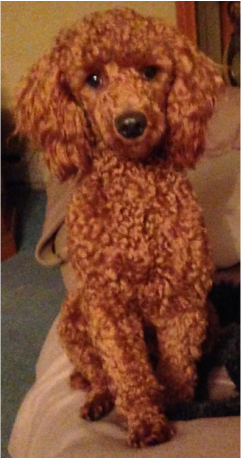 Jordy is our AKC registered dark red 17 pound miniature poodle. Hips are certified through Penn-Hip. He will sire all of our smaller and medium litters. Jordy is such a joy to have around. He loves to play and be the center of everybody's attention. He loves his toys and will play with them for hours. He's so loving and affectionate. He is also very opinionated as to who he will sit by/socialize with. If he decides he likes you, he will make you feel as if you were the most important person in the entire world! He's just a happy go lucky kind of guy and his eyes will melt your heart and soul.